"Seared on the outside with a light crust and tender on the inside. You may vary the amounts of all seasonings to suit your taste." Heat olive oil in a skillet or frying pan over high heat. Add 4 scallops to the pan and sear on all sides (about 2 minutes for each side). After turning scallops, add 1 tablespoon parsley and 1 teaspoon lemon juice. 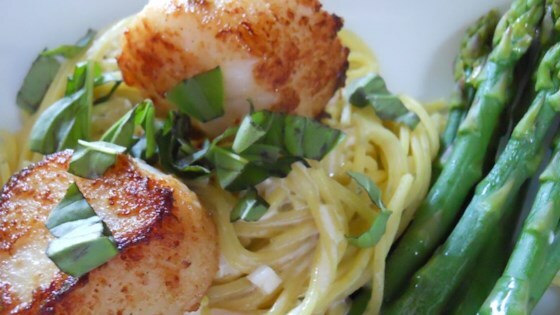 Remove scallops from pan and place on a plate in the oven to keep warm until ready to serve. I have also added Parmesan cheese to these while they are in the oven, which adds another flavor dimension.